Electronic vote counting is meant to speed up the process. File photo. The Nationalist Party is proposing a “hybrid system” to resolve what it claims to be serious issues in the electronic counting system, set to be used in the upcoming European and council elections. Under this system, each ballot is manually inspected to verify there is no visible mark which could make the voter identifiable, before it is electronically scanned to determine the voter’s preferences. Moreover, the PN is proposing that political parties will only have access to the scans of the ballots for a number of hours during the counting process, rather than up to three months after the election, as the government is proposing. Details of the amendments to the electoral laws being put forward by the PN were outlined on Tuesday during a news conference at the party headquarters by Secretary General Clyde Puli, together with MP Karol Aquilina and Angelito Sciberras from Elcom (the party’s electoral office). 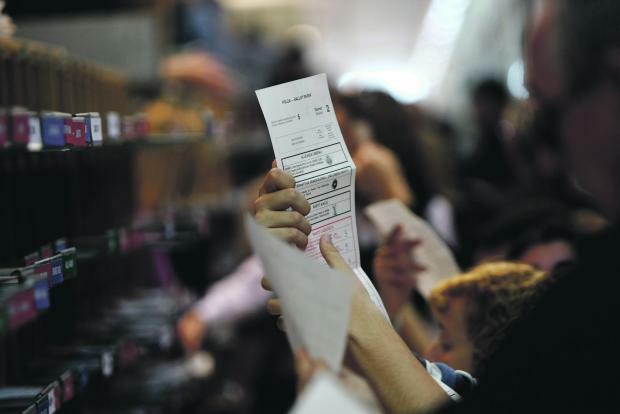 Last December, the PN had denounced the electronic voting system as flawed, following a number of mock tests. According to the party, the system had been tampered with - without the electoral commission’s knowing. Moreover, certain marks on the ballot sheet were not detected, thus fuelling concerns of corrupt practices. The PN had sounded the alarm bells that the system could be abused so that voters would be able to identify themselves, and hence open up the possibility of vote buying. In view of this, the party is now proposing that prior to scanning the ballots, each one of them should be manually inspected to verify it has no physical mark which could make it identifiable. Mr Puli noted that even a dot could give rise to certain doubts. He added that from recent mock tests on some 600 ballots which were deliberately marked, about 5 per cent were not detected. On the other hand, he said that increasing the sensitivity of the scanners would result in all votes being flagged as dubious. Mr Puli insisted that this manual process would not delay the process, saying the electronic scanning would still start at about 7am on Sunday, with the final count set to be known in the evening. However, he acknowledged that about 20 per cent of the ballots would be expected to be flagged as dubious, and consequently would have to be counted in the traditional manner. On the other hand, it was pointed out that ballot boxes could be opened up as soon as they reach the counting hall, to speed up pre-scanning process. Under this system the counting hall set up will be similar, with the exception of large monitors to see the voting documents’ scan. Moreover, political parties will still be able to take samples to get a clear indication of the result, and to verify that the final result is in line with their projections. The second PN proposal is to have access to the scanned images of the ballots during the counting process only. Moreover, the party wants to introduce a fine of up to €10,000 and up to a 12-month jail term, for anybody caught stealing these scans. Mr Puli said that from the talks held so far with the electoral commission there seemed to be the basis for an agreement.